eJuiceMonkeys.com is an Arkansas and Indiana-licensed e-liquid manufacturer and retailer, and this is our Links, Information and News portal. Please browse the categories and links and feel free to make suggestions about the site or its content. 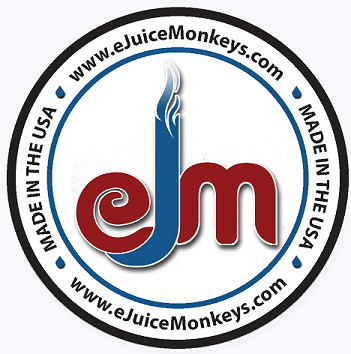 eJuiceMonkeys.com we firmly believe that for current adult tobacco smokers, vapor products are invaluable alternatives to traditional tobacco cigarettes, and we actively support ongoing research, development and education related to this. We watch and participate in related regulatory issues and work to have consumers’ voices heard. You can read more about our commitment and standard of practice on our storefront’s About Us page. If you arrived here from our store or from simply browsing the Internet for more information, you’re probably wondering “Where Do I Start?” To get started you can read our summaries: About Vapor Products and About e-Liquids. But the truth is, there have been considerable (and rapid) changes in the landscape since these were written. There was, and is so much information (and disinformation) out there that someone new to vaping can quickly become overwhelmed, confused or even discouraged. We know – we were there once. If you want to browse additional information, the E-Cigarette Forum (ECF)is a great places to find scores of material, as well as a helpful, progressive community of like-minded individuals. Along with discussions on every topic imaginable, you’ll also find videos and tutorials created and posted by veteran vapers. Any time spent on this forum is time well-spent. IMPORTANT NOTICE: The information linked to this site is for informational purposes only and is provided as a courtesy to you. None of the linked products, statements, reports, discussions, findings, opinions or subject matter in general have been evaluated or approved by the US Food and Drug Administration unless otherwise noted. While some linked materials may discuss smoking cessation and/or health, vapor products are not smoking cessation devices and eJuiceMonkeys in no way endorse them as a smoking cessation devices or ones that deliver any health benefits whatsoever, so help us FDA. Any product provider making such claims or endorsements is in clear violation of the law. Readers and customers assume all responsibility for the application of any information provided or linked to on this website. Statements and products are not intended to diagnose, treat, cure, or prevent any condition, disorder, disease or physical or mental conditions and should never be used as a substitute for your physician’s advice. No product or statement made anywhere on this site has been evaluated or approved by the US Food and Drug Administration. eJuiceMonkeys.com is not responsible for readers’ or customers’ health, safety or equipment, or any harm or damages that result from use or misuse of vapor devices, parts, liquids or information…and neither is the FDA, though they firmly believe someone else knows better and should be responsible for you.